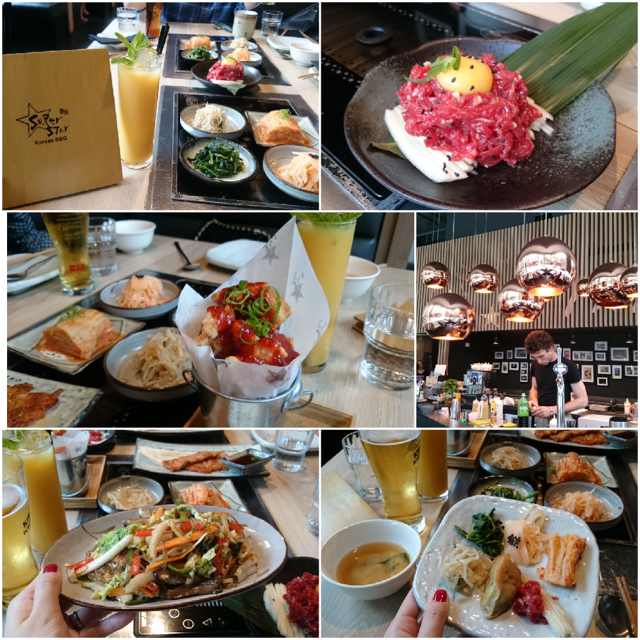 A few weeks ago we ventured into London for a foodie day! 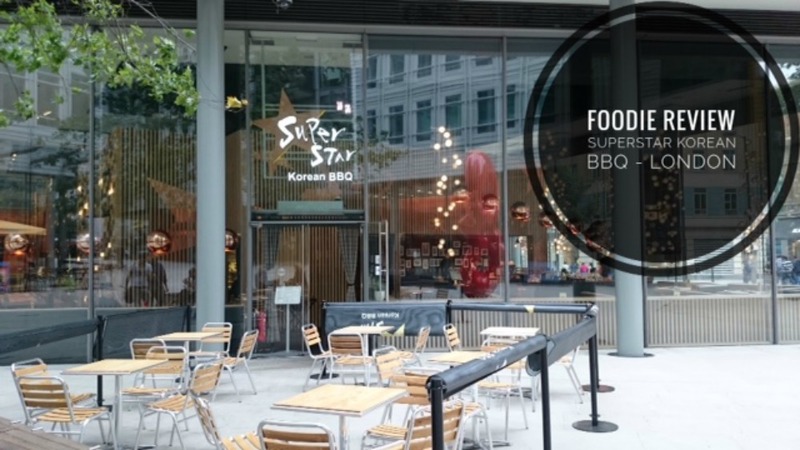 This time for a big Korean feast over at *Superstar Korean BBQ in St Giles Piazza London. For you foodie enthusiast you would have already been here as there are a few well known ramen noodle bars round the corner. Our group arrived pretty early around 6pm for dinner so it wasn't busy and we were quickly seated and started looking through the menu. The restaurant decor is modern, clean, relaxed atmosphere and I am obsessed with the copper lights. We were all pretty hungry so we wanted to order everything as usual but we settled for their set meals as they were great value for money and we get to try a bit of everything. Set 2 and Set 3 were the best ones and Set 3 being my favourite with the beef tartare, prawns and slightly better cuts of meat in my opinion. Beef tartare was absolutely delicious, very well seasoned along with an egg yolk and slices of sweet pear when all mixed in together it went very well. I would highly recommend you ordering this dish and it was my favourite. 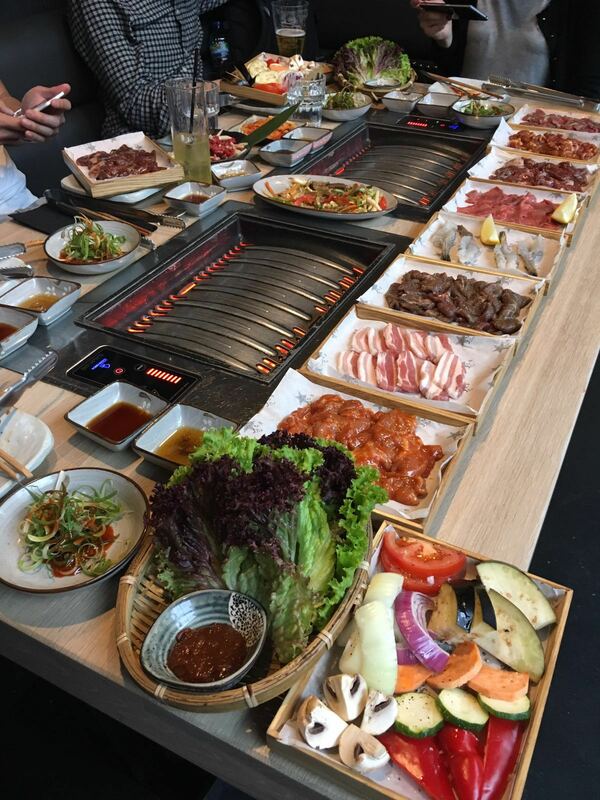 A selection of kimchi, namool and banchan also arrived shortly after which were all tasty with various different flavours to open up your appetite ready for the main course BBQ! This is exactly why we picked the set meals so we can try a bit of everything. 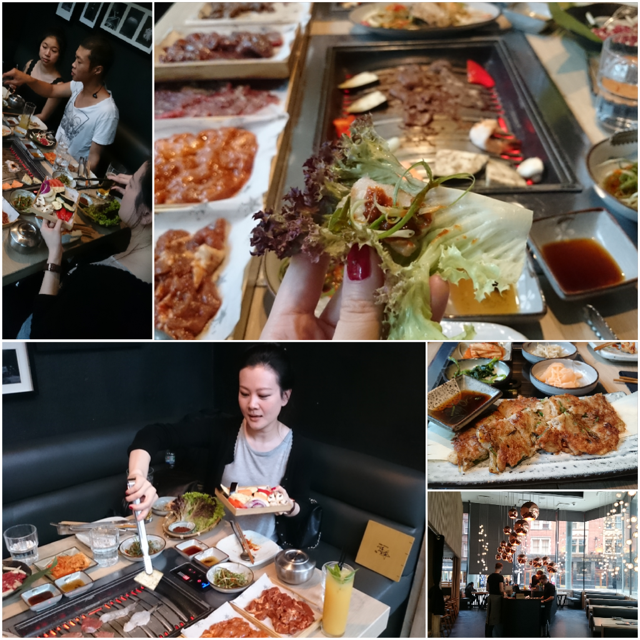 Our BBQ main course was absolutely epic with portions of rib galbi, beef boolgogi, spicy chicken (my least favourite), spicy pork, sesame & garlic sirloin (delicious), rib galbi (delicious), wine pork belly (delicious), tiger prawns and a selection of grilled vegetables. We were also given som sangchu salad, mixed lettuce and miso paste to wrap the various meat inside nom nom nom! When all this arrived we did think how are we going to finish it but we gobbled up all the meat surprisingly quick...we could have done with an even bigger table but we managed haha! While the BBQ was in full swing a hot stone bibimbap also came. The bowl looks pretty big in this photo but it was the cutest minature size so after sharing it around it was just a spoon each to try it out which was just enough and it came with a sweet chili sauce. After all that we finished the meal off with a mini fruit platter and a shot of Korean cinnamon drink which I wasn't too keen on personally however my friend enjoyed it. We all left with a huge food belly and I highly recommend this place if there are a few of you so you can order the different set meals and try everything out. The set meal portions are very generous so each of the set meal is probably enough for 3 people. It's been a while since we had Korean BBQ so we enjoyed it very much so thanks for having us! Bit of a short post but I the photos do all the talking!